To celebrate the important role plumbing has in the health and safety of modern society, the World Plumbing Council initiated an international event every year on 11 March. 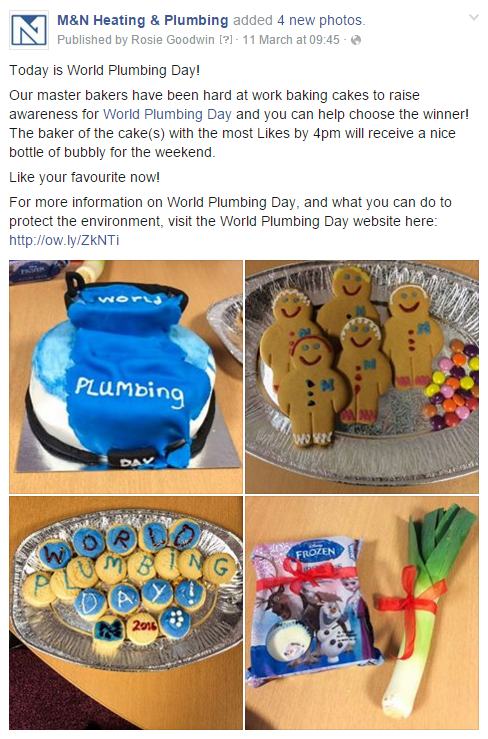 This year, M&N Heating & Plumbing held a plumbing-related baking competition to help raise awareness of World Plumbing Day. In partnership with the World Health Organisation, the World Plumbing Council (WPC) works year-round to develop and promote the image and standards of the plumbing industry worldwide. The WPC's mission statement is 'to promote the role of plumbing in the improvement of public health and safeguarding the environment by uniting the plumbing industry worldwide for the benefit of all'. Whilst every year, 11 March is a day to mark the occasion and draw attention to the importance of high quality plumbing and sanitation. Whilst we may take clean water for granted here in the UK, more than 650 million people worldwide live without safe drinking water. The World Plumbing Council has a pivotal role in improving public health through the provision and protection of safe water. To help raise awareness, M&N Heating & Plumbing employees were encouraged to demonstrate their baking skills with a plumbing-related cake competition. The baker with the most Facebook likes by 4pm would receive a bottle of bubbly for the weekend. 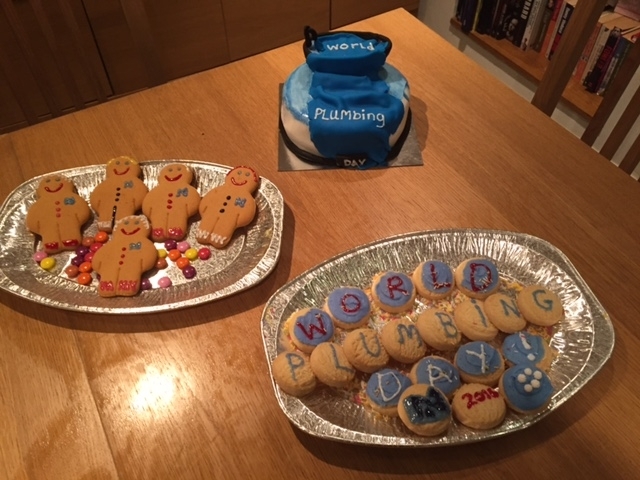 There were four entries in total, including a leaking bath atop a sponge cake, M&N Heating & Plumbing gingerbread men, World Plumbing Day shortbread biscuits and a last minute pun-related entry. The final entry suggested calling M&N Heating & Plumbing should you have 'Frozen' or 'leeking' pipes! The M&N Heating & Plumbing gingerbread men stole the show with the most likes, beating the leaking bath sponge cake in second, and the 'Frozen' & 'leeking' pipes entry in third. Thank you to everyone who liked and shared the post, achieving the main aim to raise awareness for this important event in the plumbing industry. For more information about World Plumbing Day, visit the World Plumbing Council website or follow @WPlumbingDay on Twitter today.